A Big Red Wine full of Complex Flavors and Tannins. Crafted from Oaked Norton & Cabernet Sauvignon, this wine Displays Rich Earthen Flavors with Deep Plum Colors. Named to Highlight our Farm Land's colorful history of alcohol production. A Stainless Steel Fermented Wine that is a Dry, Crisp White Wine with Citrus and Floral Aromas. It displays Good minerality and has Grapefruit and Stone Flavors. This Unique Varietal Wine has is stylistically Similar to a Sweet Riesling. It has a wonderful Rose Petal Nose, a Silky Body and boasts Wild Flower and Honey Flavors. It displays a Light Golden Color. This Wine is similar in style to Soft Pressed French Blushes with just a touch of sweetness. It has Floral aromas with tropical fruit flavors and displays a Pink Amber Color. This is a Red Wine that is Crafted in the Beaujolais Style. It is an Easy Drinking, Off Dry, Medium Bodied Wine with a Distinctive Floral Nose and Ruby Red Color. This is a great table wine that will compliment many different types of food. A wine with Aromas of Almonds and Black Cherry that displays a Crimson Pomegranate Color. It has Subtle Fruit, with Notes of Plum and Sweet Shrub. This Wine has Good Tannins that are expressed on the Finish. Named for our two daughters, both Sassy in their own right, who are depicted on the label. This is a Sweet Wine Crafted from our Catawba grapes. It has Aromas of Hard Candy and Jolly Rancher with a Silky Mouth Feel. Enjoy it as an apéritif or with spicy foods. Best Served Chilled. 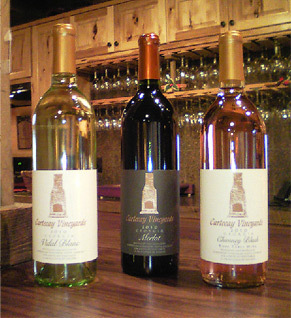 A Delightful, Dessert Style Wine Crafted from our Norton (Cynthiana) Grapes. It displays a Rich Plum Color and has Aromas of Dark Fruit and Brown Sugar. It has a Silky Mouth Feel with Notes of Chocolate and Almonds. This wine pairs with Cakes & Fruit Filled Pies. A seasonal nouveau Wine only available during the Holidays. A light drinking sweet, wine with flavors of Berries and Christmas.